Do you want to choose, or should I ? 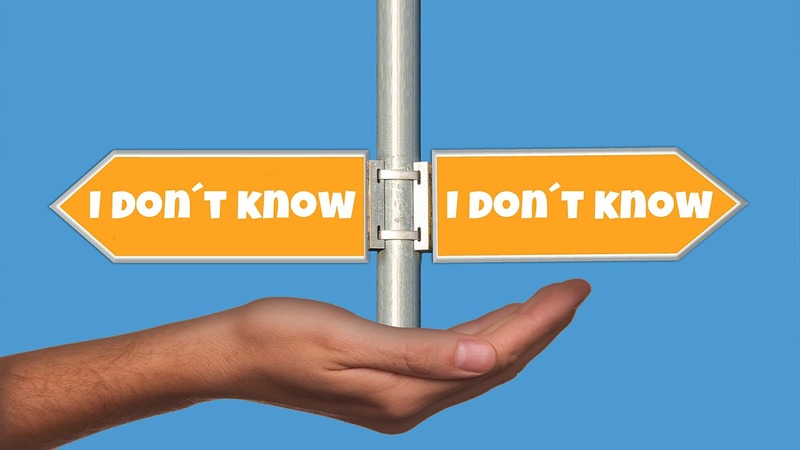 Not knowing which way to go next is in some ways made easier if one doesn't have a clue to begin with. One doesn't have to weigh the +'s and -'s. Q: "How does one open this parachute?" A: "I don't know. We'll figure that out on the way down." In that case, talking about "Breaking New Ground," may not be the best analogy to use. Woops! It seems like there's a problem there as well. It seems that if a method cannot be challenged to produce results by methods limited to the material world, it's results remain unconfirmed. Or, impossible to confirm. Or, beyond confirmation. Some kind of Heisenberg problem of being incapable of measuring mass and position at the same time. A problem of observing without being seen, since one risks throwing the whole experiment out of kilter, by one's very presence. 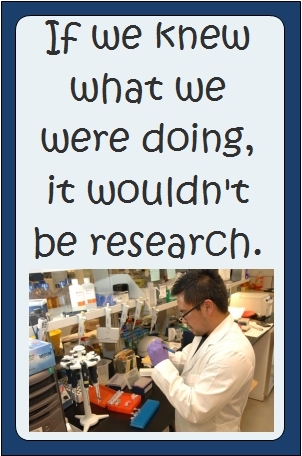 Maybe we need a new hypothesis, or a different research protocol. Won't matter if nobody's going to fund this project. So forget about it. What's getting funded now-a-days? Perhaps a hair growing product for male pattern baldness. Something to focus on besides all this invisible Peace stuff, that's just so darn hard to measure. Hope we're not targetting poor people in this pie of market share. Who makes a buck in this world of Peace? Just through donations I suppose. But maybe there's some other spin that one could put on this whole thing to get beyond donations. But afterall, what tangible product do we have to sell? Meditation? I think others already have that covered. "Tangible product" = tools, techniques, methods. If the Dalai Lama doesn't today have a specific method, or no one is listening very long, except at Commencement exercises and TED Talks, why should we hope to discover one? As an increasing number of the world's 7.3 billion people becomes more and more "bummed out" (I would not yet say "bombed out," though that may be just around the corner) about the way things are going, suddenly something may be starting to open up. Pehaps a need that many had all along without knowing it, is now becoming palpable. Making more and more people say: "Now," seems increasingly popular. This is more than a decision about belief in whether or not Healing at a Distance, works or not. A new sense of opening, arising in a deeper and more broadly held feeling best summarized as "We'll take anything that works." So now, let's use this space to systematically explore, things that might work. "Systematic" also implies not losing scientific objectivity. Loss of science, also means, loss of supporters. Not financial, but of the ideas that are eventually offered here as "tangible product." For many participants in today's global Religion of Science, in its material foundations, will have a difficult time finding a way to move their corporeal particles through walls. So to protect SendThemPeace.com from such loss of participants, what would be required? Education. Moving from known to unknown. If you have a hard time believing that you should be solving more problems aimed at reducing stress in your life, by using your heart instead of your head, maybe you need a bit more education. Starting with what you likely already know and understand, and moving towards a possible "tangible product," even if it now resides in completely unknown territory. Not abandoning objectivity, but also not dismissing something instantaneously because science doesn't know, or you don't understand the science that does know. I will call that education or re-education, and simply invite you to stop by here from time to time. Here in the Lab at SendThemPeace.com, to see how the research is coming along. Research requires curiosity, or it becomes just another boring job, so let a little curiosity awaken in you as well. Stop by with the thought: "Gee, the last time I checked in, you had just started some pretty interesting investigations. What happened to those?" As we begin here, Steven Covey would ask, paraphrasing: "What is the end that you have in mind?" Other scientists might ask: "What is your hypothesis?" 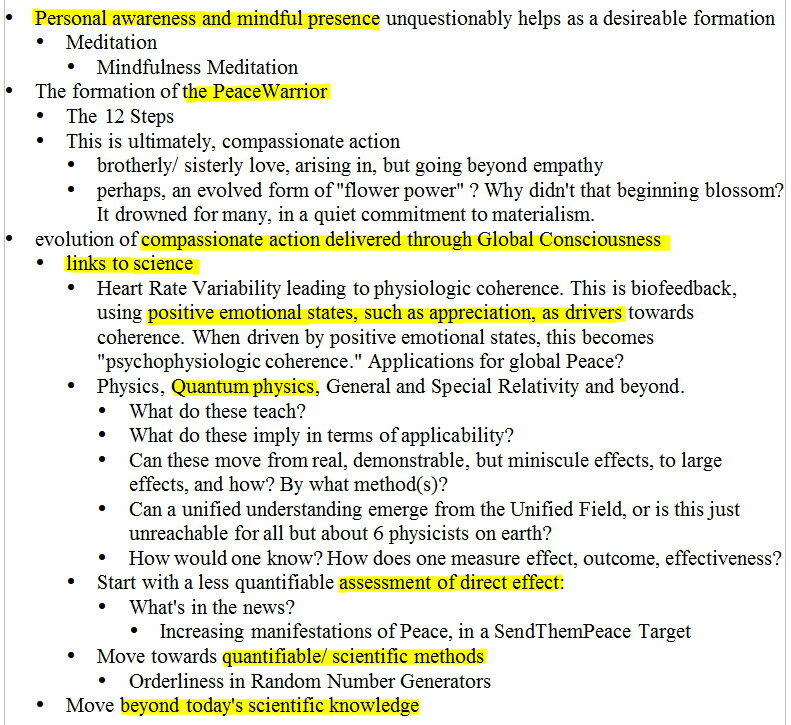 That a method exists that can be discovered or developed, to reduce or remove violence from our lives through mass action of global consciousness, directed at specific targets, acting at a distance, at specific times, and for a specific duration. OK. That seems pretty straight forward! And the scientists will not hesitate to ask: "And what are your methods? Could I get a copy of your protocol?" Some are asking out of a desire for pure objectivity, which is OK. To quickly compare with what they already know and take as proven. Some are already thinking about duplicating the protocol, to see if their results support or refute the hypothesis. And some are simply interested in swiping the idea, publishing it first, because, many scientists have simply become like that, if they weren't always like that. Ego is a terrible master, and a difficult lab bench partner to work with. Others, "scientists" or not, will jump in to say with a smirk: "It's already been done. Look at the experiments done using Transcendental Meditation to reduce violent crime or war. It works. It's been done. Find another hypothesis to test." My quick response is that many of the specific experiments just mentioned, lack the scientific objectivity (which one doesn't just create at whim), that we would like to remain dedicated to here at the outset. And "tangible products," or methods, are sometimes clouded in layers of non-transparent agendas. "Eschew," seems an excellent word to include in our lab manual as we scan the horizon for light from stars. Statisticians will correctly ask: "How would you know?" That's not a challenge directed at one's capability and to be taken personally, such as "How would you know, dummy?" It is instead a paraphrase of sorts for: "By what method(s) could you come to know that an actual effect can be attributed to what you're doing here at SendThemPeace.com?" So, "How would you know?" remains a valid and essential query. Looks like this article is getting a bit long, so to keep the promise made on the Home page, let's propose an initial outline of what one might include. Come back to the lab from time to time, and say "Hello!" We'll be hard at work, but always happy to take a little break. "OK. But HOW ? Where is the work getting done ? The STP Lab and its Benches.